The chart below suggests that the 30 richest American contributors have more centrist CFscores (a metric developed by Bonica for examining ideology) than small donors, while the donors from the Forbes 400 list and the directors and executives of the Fortune 500 companies skew right. The chart also includes the donations of the top .01 percent of donors. (“In 2012, 62 percent of contribution dollars raised from the top 0.01 percent went to Republicans.”) The donations include anything given between 2004 and 2012. However, there are limitations to drawing too much inference from these data to the effect of donors on policy. Since the rich tend to be socially liberal, but economically moderate or even conservative, then this will shift policy in important ways. Indeed, of the five most left of the 30 richest (Larry Page, Sergey Brin, George Soros, Anne Cox Chambers and James Simons), only one, George Soros, is known for being deeply concerned with economic inequality. On the other hand, the far right -- occupied by Charles Koch and David Koch, as well as the Walton family -- tend to pursue an agenda that is very much to the economic right. Further, it’s difficult to know what the scores would look like in historical context. According to DW-Nominate, a similar measure to Bonica's CFscore, “The most conservative Republicans in the House 25 or 30 years ago would be among the most liberal members now.” So it might be that today’s billionaire donors seem to moderate because the scale has already been shifted to the right. Paul Pierson and Jacob Hacker showed in "Winner-Take-All Politics" how increasing reliance on big donors and fundraising has shifted Democrats away from traditional bastions of Democratic support like labor. The Democratic Leadership Council (DLC), which “placed heavy stress on deficit reduction as a key element of economic policy,” was indicative of this trend. 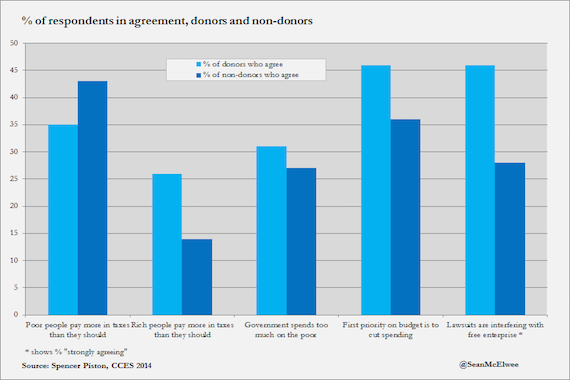 Political scientists Peter Francia, John Green, Paul Herrnson, Lynda Powell and Clyde Wilcox find that Republican and Democratic donors are distinct from their bases, tending to be more ideologically extreme. 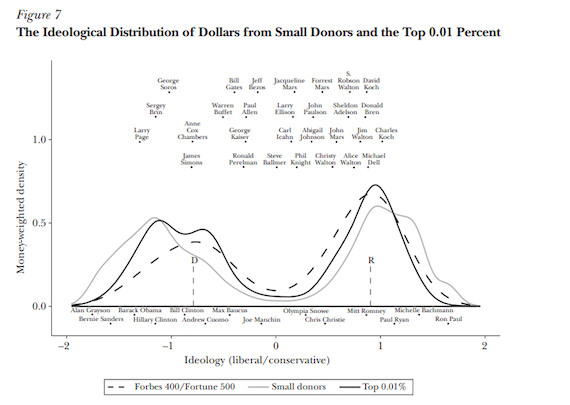 The differences they find are interesting: Most Democratic donors are "liberal on social issues, reinforcing the stereotype of the 'limousine liberal,' whereas most Republican donors are united in their support of business, reinforcing their 'corporate conservative' image.” On the Democratic side, however, they find a large “New Democratic” contingent opposed to redistribution. Somewhat surprisingly, “New Democrats rate the Chamber of Commerce more favorably than they do the AFL-CIO.” The authors find that "large percentage of Democratic donors, especially New Democrats, belong to business organizations." As I’ve shown elsewhere, there is strong reason to believe that the increasing power of these donors, and the increasing marginalization of unions, has pulled American politics to the right. Obviously, the studies I cite have limitations -- we can’t examine granular policy data on the super-rich donors the way we can on the merely rich. Masket is right to caution from sweeping assertions about how money influences policy -- there are a lot of dark areas and a lot of grey areas.